By now you should now that I love tasty food. I love meat, I love veggies – so living a Paleo life has been, as the kids say, “totes amazeballs.” I know, I am such a weirdo … Anyway. Today I celebrated Easter in true Colorado-style – a short hike in Garden on the Gods, followed by grilling out and eating on the deck. With brilliant blue skies, a hot sun, and 70-degree weather, I’m not only rocking a full belly, but a sweet early-spring sunburn as well. What did we eat? Spicy beef burgers paired with sweet potato/carrot buns, topped with caramelized onions and Bird Dog BBQ sauce (leftover from lunch yesterday), paired with grilled asparagus and raw veggies. Caramelized Onions – start these first. Slice 1 yellow onion into thin rings. Add to a skillet with 3 tablespoons butter. Cook on low-medium heat while you prepare the burgers and the buns. Stir the onions every so often to prevent sticking and/or burning. When done, pile these delicious, sweet, buttery suckers onto your burger and enjoy. The burger and bun recipes came from Practical Paleo. Go buy this book. Seriously. Heat up the grill to medium-high heat. Grill the jalapeno until the skin is completely blackened. Then run under cool water and use a knife to scrape off the skin. DO NOT TOUCH WITH YOUR FINGERS. I once diced jalapenos and then touched my eye. Never again. Never. Remove the seeds and then mince the jalapeno. Mix all ingredients in a large mixing ground, being sure to mix thoroughly. Grill 5 minutes each side or until done to your preference. 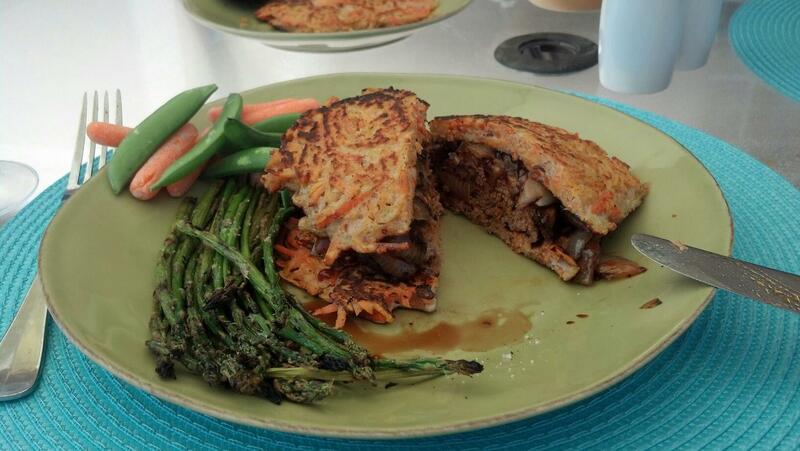 Carrot/Sweet Potato Pancakes – yields- 5 large pancakes. Next time I am going to aim for 8 smaller pancakes so that they don’t overhang the burgers quite as much (see photo). In a medium-sized bowl, use an egg beater to mix the eggs with the coconut four, cinnamon, ground ginger and sea salt. Place the shredded sweet potato and carrot into a large microwave-safe bowl. Cover with a microwave-safe plate. Add 2 tablespoons water and the nuke for 5 minutes. This will make your sweet potato/carrot mixture soft and easier to cook. Mix the shredded sweet potato/carrot mixture with the rest of the ingredients until well combined. In a skillet, heat up coconut oil over medium-high heat. Drop mixture into the skillet. When bubbles appear on the pancake, flip it over. sounds like a great way to spend Easter! and what a yummy idea to use sweet potato/carrot for the buns!